I have on good authority from sources here in Egypt that US Secretary of State John Kerry will attend the much-hyped “economic development conference” to be held March 13-15 in the Sharm el-Sheikh resort. The conference is a giant attempt by Abdel Fattah el-Sisi’s military regime to boster its legitimacy with an increasingly skeptical public, by showing it can entice international investors. The hopes he’s raising are all trickle-down ones, without much trickle. Most of the projects he’ll hawk to bankers and businessmen will be of no benefit to ordinary Egyptians — though they promise profits to well-placed construction and real estate magnates who made their fortunes under Mubarak’s dictatorship, and have been key Sisi supporters. 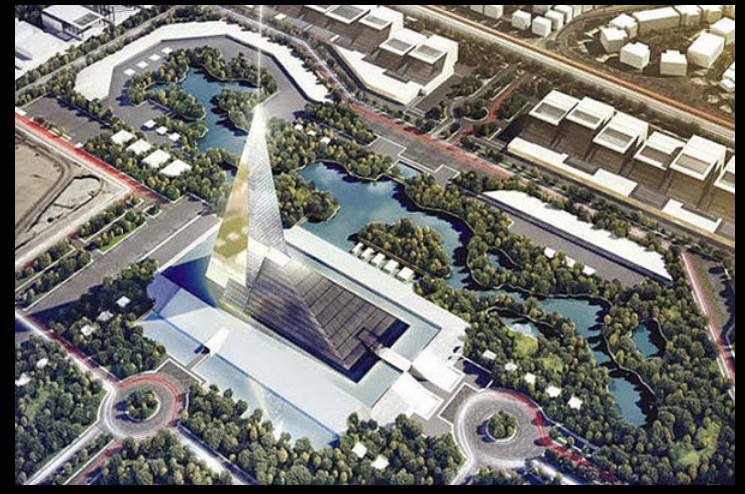 Up for grabs, for instance, will be shares in this $20-billion glass-and-steel pyramid: planned as the tallest building in Egypt, and to be named after the founder of the United Arab Emirates, which is expected to make the down payment. This grotesque monument says something about Sisi’s Pharaonic dreams. To the tens of millions of Egypt’s poor, it’s a 600-foot middle finger. The US already gives almost 1.5 billion in mostly military aid to Egypt. 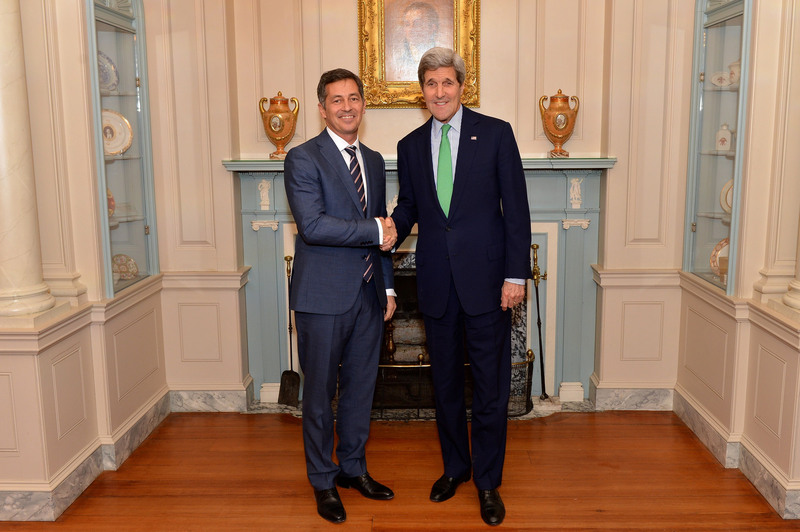 Kerry won’t be bearing many gifts on top of that; there’s practically no more to give. His job will be to help sell Sisi’s government to the fat-walleted but skeptical. He’s there as a PR agent. 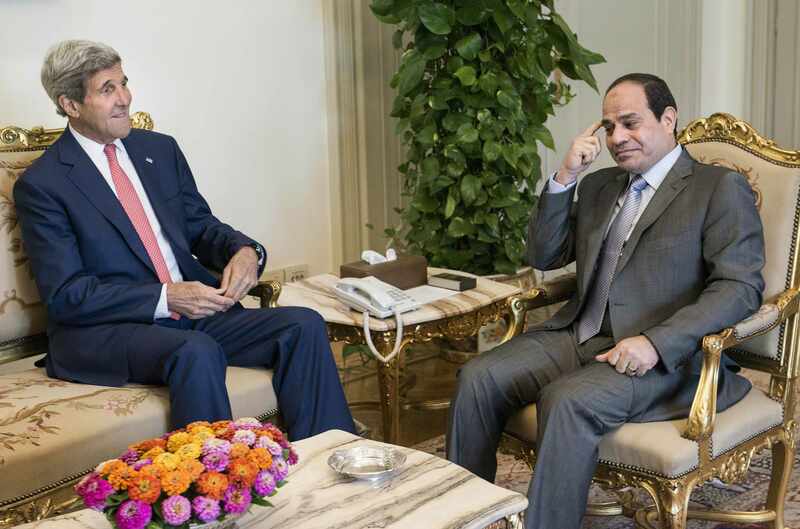 Since Sisi’s 2013 coup, Kerry has shown little or no concern over burgeoning, brutal rights abuses in Egypt. (He’s largely ignored efforts by the US embassy in Cairo, and by Anne Patterson, assistant Secretary of State for Near Eastern Affairs, to keep the rollback of democracy on the agenda.) Last summer, for instance — in a callow slap in the face to Egypt’s embattled human rights activists — Kerry handed Sisi almost $600 million in suspended US military aid, along with 10 long-promised Apache helicopters, just one day after the regime mauled and arrested dozens of protesters against its draconian anti-protest law. Among those jailed (and now serving two years in prison for the crime of carrying signs on the street) were the democracy activist Sanaa Seif — daughter of the late Ahmed Seif el-Islam, Egypt’s best-known human rights lawyer — and my friend the brave feminist Yara Sallam. Political prisoners in the country now number, by many estimates, over 40,000. The UK human rights group Reprieve has condemned the British government’s decision to join the Sharm el-Sheikh gala. “Economic development must go hand-in-hand with respect for human rights,” says Reprieve’s Maya Foa; “but while the Egyptian government presides over a wave of human rights abuses, the UK’s ‘business as usual’ approach is giving it the imprimatur of approval. …. Ministers should use President Sisi’s summit to demand justice,” she adds,”before it’s too late.” But Britain, cautiously, is only sending a junior minister to the summit. What can be said when the leader of American foreign policy himself shows up to raise money for a killer regime? It’s no surprise when the United States ignores the crimes of dictatorial allies. But when it rents out its highest diplomat as their lobbyist and PR man, that goes beyond the call of duty. We have a moral obligation to speak out against the persecution and the marginalization of LGBT persons. And we have a moral obligation to promote societies that are more just, fair, and tolerant. It is the right thing to do. But make no mistake: It’s also a strategic necessity. Greater protection of human rights leads to greater stability, prosperity, tolerance, inclusivity, and it is not a question of occasionally – always this is what happens.